A worm farm is a fantastic way to minimize your food waste by turning it into a rich fertilizer for your plants and soil. There are various types of commercial worm farms available to choose from. If you are interested in buying a worm farm, then this article will help you choose the right worm farm for your needs. We’ve done all of the hard work for you to put together the best worm farm reviews. Our reviews are based on our own experience, hundreds of Amazon reviews, other blogs and numerous Youtube videos. Jump straight to our reviews of the best worm farms. 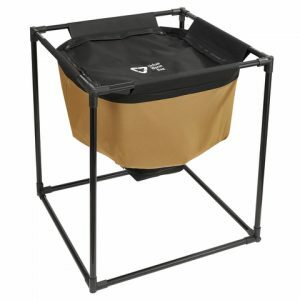 Worm Factory 360 Medium A high quality designed stackable worm farm with 4 trays expandable up to 8. A good worm farm for outdoors that comes with lots of extras bundled. VermiHut 5-Tray Low Compact and comes with 5 trays. A more affordable option. Urbalive Indoor Medium A sleek and modern designed stackable worm farm for indoors which has 2 trays. An indoor worm farm for small amounts of food waste that can be used all year round. Can O Worms Low Round with 2 trays. Medium size. A basic worm farm for beginners. Worm Cafe Low A basic stackable worm bin that is rectangle with 3 trays. A basic worm farm for beginners. Hungry Bin High A high quality innovative flow-through designed worm farm which has a large capacity. Can easily move around on wheels. If you have a lot of food waste and need a larger capacity worm farm. Chef’s Star Low A basic stackable system that is compact with 3 trays. A small worm farm that is affordable. Medium A unique flow-through designed worm farm that hangs from a stand and has terrific air ventilation. If you’re looking for a worm farm that is highly breathable. OK. Now lets get down to business. Here are our reviews of the best worm farms you can buy on the market. The Worm Factory 360 is a stackable worm bin made from recycled plastic. Plastic is not very breathable, but the upside is it will help to keep the moisture in. The worm farm kit comes with some bedding material including coconut coir, mineral dust and pumice. As well as some tools including a scraper, rake, thermometer, pH meter and moisture meter. The worm farm kit also comes with instructional DVD, a manual and a 70 page book called “The Complete Guide to Vermicomposting With the Worm Factory 360″. As a bonus, the lid has a sticker on top which provides some useful worm farming tips and advice. The worm farm includes 4 vertically stacked trays, allowing you to have more than one working tray at a time. It’s easy to get started; you just fill the bottom tray with bedding, food waste, and worms. As your worm colony grows, you can just add more trays. The worms will migrate upwards to feed. The number of trays can be expanded up to 8. If trays are too full, the weight compresses the worm castings in the lower trays which can restrict airflow. There’s a detachable worm ladder for the base of the worm farm. This helps your worms climb back up into the bottom tray in case they get down into the base. The spigot makes it easy drain and collect worm farm leachate or worm tea. But it can sometimes get clogged with worm castings. The legs are slightly angled outwards and a little wider which helps to make the worm farm more stable. The lid double acts as a stand to hold the trays when you need to harvest the worm castings. The bottom of the trays will be covered in compost so this helps to make the process a bit cleaner; especially if your worm farm is kept indoors. Worm ladder helps worms climb back up to the bottom tray if they get down to the base. Bundled with an instruction DVD and a 70 page book on how to use the Worm Factory 360. A durable design and quite stable as a freestanding structure. The trays are not too large so they’re still easy to move around when full. The spigot makes it easy to drain any excess liquid. It’s quick and easy to setup. The lid double acts as a stand for trays when harvesting worm casting. Not too big so it can be stored either inside or outside. It’s plastic and isn’t very breathable. Spigot can get clogged with worm castings. When using lots of trays, the lower trays can get compressed which restricts airflow. The VermiHut 5-Tray is one of the best worm farms if you’re looking for a more affordable option. It has an aesthetic design and is made from recycled plastic. It comes with a lid, five stacking trays, a liquid collection tray, and a pedestal base. The trays can expanded up to 7 trays so there’s plenty of room for your worms to grow. The bottom tray sits on top of a plastic board or cloth filter which helps to stop your worms from falling into the liquid collection tray. The worm bin is compact which makes it suitable for smaller backyards, courtyards and balconies etc… It is straightforward to assemble. And like other stackable worm farms, it is very easy to use and maintain. The lid is shaped like a roof with air holes on the side for greater ventilation which is a big plus. The downside is the air holes are fairly large which makes harder to keep pests out and enables your worms to escape. Note that worms may try to escape if the conditions in the worm bin are unsuitable to live in (e.g. temperature, pH level, moisture etc…). The worm farm comes with an instruction manual and coconut coir bedding block to help you get started. The Urbalive Indoor worm farm is one of the best indoor worm farms available. It is a more expensive worm farm with a sleek and modern design. This worm farm looks more like chic furniture, so it wont look out of place inside. The worm farm is made from recycled polyethylene and it comes with 2 stackable trays. A step-by-step instruction guide is provided to help you get started. The worm farm is super easy to setup; most of it is already assembled except the legs. There’s a spigot on the bottom rather than on the side which is unusual. In order to collect worm farm leachate or worm tea, you’ll need to slide a container underneath which is somewhat annoying. The lid is little tricky to close as well. And be mindful that even indoor worm farms will attract fruit flies and bugs. The cloth handles of the screen between the base and the bottom tray are known to degrade. The Urbalive Indoor worm farm is an excellent choice if you’re looking for a worm farm that can be used indoors. The Can O Worms is a great worm farm for beginners. It is a 2 tier circle worm farm, made from recycled plastic. The bottom tray is the processing tray and the top tray is the working tray where the worms feed on organic food waste. When the top tray is full, you harvest the bottom tray and rotate the trays so the bottom tray becomes the top tray. The worm farm is very easy to setup, with no screws needed. It also comes bundled with a coconut coir bedding block to help you get started. The round shape of the worm farm is unique and appealing at first. But it takes up more space compared to a square design. In addition to this, whenever you cover up food with newspaper or cardboard, you will never be able to tear it perfectly to fit along the rounded sides. The lid has plenty of small air holes for ventilation. It keeps flies out and worms cannot escape. Although some rainwater may get in. The worm farm only comes in black which absorbs heat quickly. The trays are large and bulky which makes them difficult to lift. The legs are not very strong and become unstable under the weight. The liquid collection tray is fairly big which improves airflow to the bottom tray. The other benefit is you do not need to collect the worm farm leachate or worm tea very frequently. There’s also a handy worm mound so that your worms can climb back up into the bottom tray. The Can O Worms is a good starter worm farm, and it’s height makes it ideal for kids. For more information, read our in-depth Can O Worms review. The Worm Cafe is a 3 tier stackable worm farm, made from recycled plastic. Even though it is made from plastic, the worm farm is quite sturdy. There are 3 large trays which each have air ventilation holes on the sides. It has a similar design to the Can-O-Worms worm farm except that it is rectangular in shape. The lid is hinged which makes it easier to feed the worms. Instructions are also engraved on it’s underside of the lid. The liquid collection tray is fairly large, with a worm mound so that worms can climb back into the bottom tray. The Hungry Bin worm farm lives up to it’s name as an efficient food processor. It’s innovative flow-through patented design makes it super easy to maintain. This is one of the best worm farms productivity wise, but it comes at a high price. Worm castings should only be harvested when the bin is nearly full. As the bin is large, this can take a long time if you do not produce much food waste. If you attempt to harvest the worm castings too early before it is properly compacted, all the material present in the bin, including the worms, will fall out. To harvest the worm castings you just need to release the bottom of the bin. The floor should be full of worm castings. Since worms migrate upwards to the surface to feed, the castings will be worm free. The top of the bin has a larger surface area and the lid has lots of air holes for ventilation. However airflow can be a problem due to the scale of the Hungry Bin. The structure of the bin is sturdy and you can move it around on wheels. There’s a drip tray which sits underneath the bottom in the open. For more information, read our in-depth Hungry Bin review. The Chef’s Star worm farm is stackable 3 tray worm farm made from durable terracotta polyethylene. The design is compact and doesn’t take up a lot of space. The worm farm is quick and easy to assemble. The lid comes with a useful handle and it has some some air holes for ventilation. The spigot drains any excess liquid for easy worm tea collection. A feedback theme is the instructions are incomplete. The Exaco 610016 moves around on 6 wheels and has an eye catching design with bright colors. This worm farm would not look out of place inside your home. The worm farm is made from plastic and does not have any ventilation features. 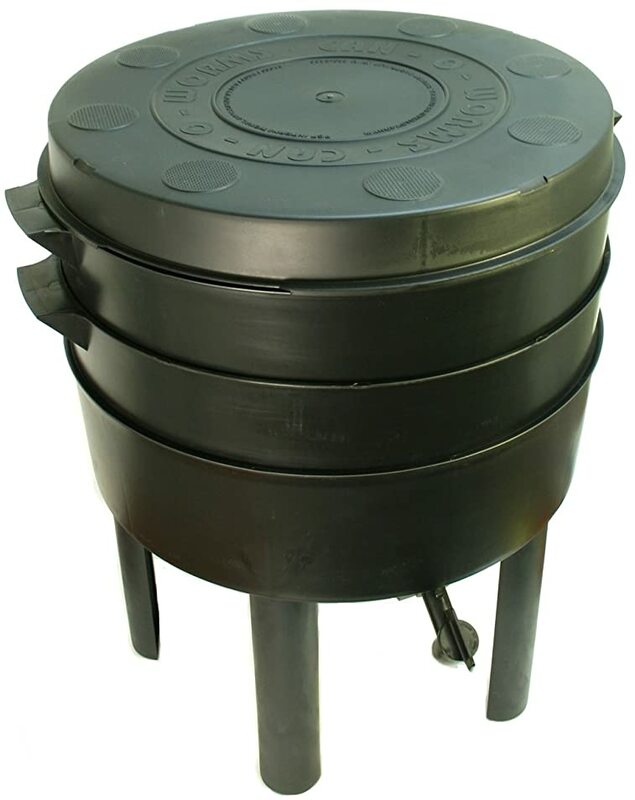 It has 3 trays or rings and the lid is designed to hang on the side of the bin when in use. The trays can become difficult to pull a part over time. There’s also a reservoir to catch the worm farm leachate or worm tea. Note there has been some complaints that the instructions are not in English; but you can find them online. The trays are hard to pull a part. It is almost like a tight suction. It’s plastic and isn’t very breathable. This can make the worm farm too moist and muggy. Airflow is key to producing high quality vermicompost. The Urban Worm Bag is one of the most breathable worm composters. One of the criticisms of plastic worm bins is they are prone to become too wet and anaerobic. The Urban Worm Bag on the other hand is made out of a breathable fabric. Please leave a comment below with your own thoughts on the best worm farms that you can buy.